Natural Compounds: The Missing Link In Healing? PUTRAJAYA, 18 Mar 2014 – Malaysia should capitalise the properties of its natural products which have been found to have healing and medicinal properties. 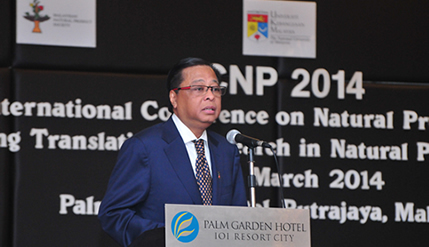 Minister of Agriculture Dato’ Sri Ismail Sabri Yaakob said the findings needed to be protected with patents and then commercialised. Otherwise their properties will just look good on paper, he said when opening a two day International Conference on Natural Products at the Palm Garden Hotel here today. The conference which drew participants from 10 countries was organised by The National University of Malaysia (UKM) and Malaysian Natural Compound Association (PSSM). Ismail Sabri said it was difficult to appreciate the discoveries made because the papers presented were laden with scientific jargons. Altogether nearly 200 papers were presented. The minister said the potential of the natural plants makes one wonder why they have not been commercialised. Who would have thought that a vitamin E derived from palm trees can reverse osteoporosis, or the black seeds (nigella sativa) can significantly inhibit lung cancer cells? And this is only the tip of the iceberg. Natural plants, he said, have huge potential and it is no longer a secret that certain plants are great antioxidants. The findings reveal that they are anti cancer, anti diabetes and can help people quit smoking. Even these do not do justice to what some of the natural plants can do. One plant called ‘daun kadok’ in Malay (piper sarmentosum) which grows wild and easily even in the backyard of some houses without needing any maintenance or watering has been found to prevent and reduce obesity. It actually inhibits the very substance that makes people fat. Obesity is the cause of many lifestyle diseases. If diabetes can be prevented, the number of those developing hypertension and heart diseases can significantly be reduced. Though further studies are needed to investigate the mechanism involves, it is a potential gold mine, Ismail Sabri said. The researches reveal something that is more astonishing as the ‘kadok’ leaf which many people regard as a weed has also been found to have similar effect as statin that lowers cholesterol levels in heart patients. This is a very big deal because it has the potential of replacing statin which is known to adversely affect kidneys. Deputy Vice Chancellor (Academic and International Affairs) Prof Ir Dr Riza Atiq Abdullah O.K Rahmat, Dean of the Faculty of Pharmacy Profesor Dr Ibrahim Jantan, scientists and researchers attended the conference.